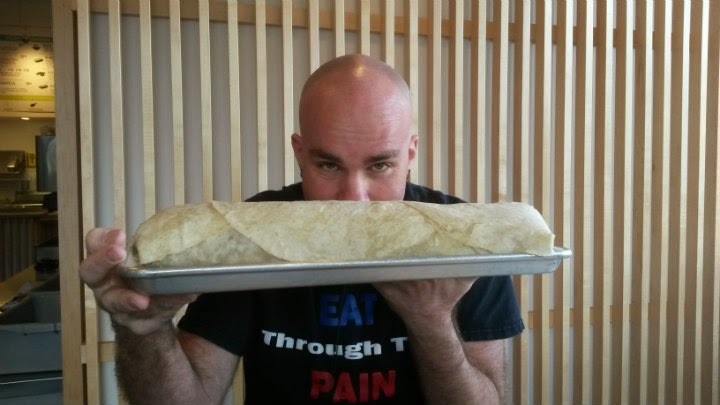 On April 25, 2015, two members of the Big Eaters Club traveled to KOi Fusion's D-Street spot (near SE 30th and Division) to take on a new 7-pound burrito challenge. While an official name was still being decided on as of April 25, it appears they will be going with "KBOMB." Another possible name was "Knockout" (a play on the capitalized "KO" in KOi Fusion). 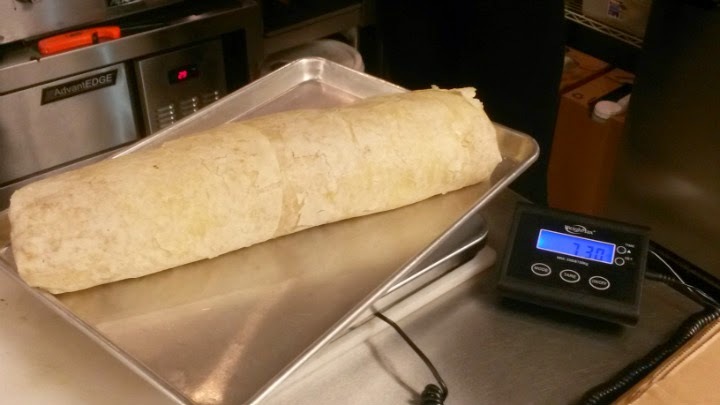 The "regular" burrito here is probably around 1 to 1.5 pounds. Choice of meat or tofu, kimchi fried rice, mozzarella, and all their vegetables (fresh and pickled -- including kimchi), and sour cream inside a large flour tortilla. 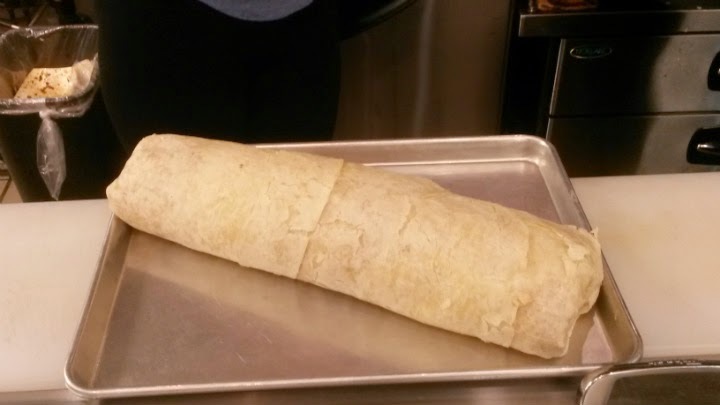 The KBOMB uses five flour tortillas, so it's the rough equivalent of consuming five regular burritos. 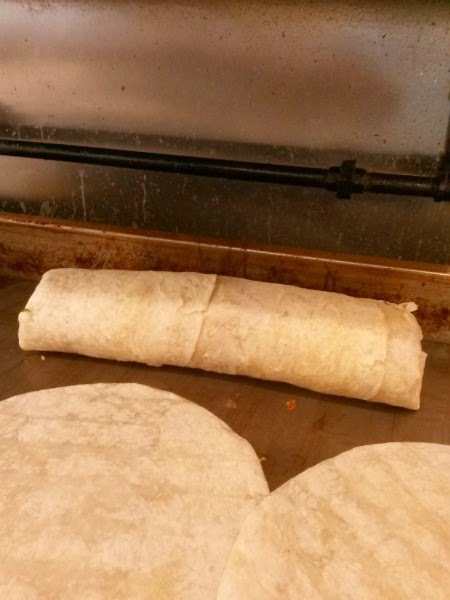 All burritos are placed back on the flattop grill for a bit to warm up. Yes, you'll have to sign a waiver. The time limit is 30 minutes, but given the amount of chewing and how dry the inside is (tons of rice and meat, not a lot of sauce) I hope they stretch the time limit to an hour. From Twitter and Facebook posts, the prototype for this challenge was about 6.3 pounds. Of course, each burrito is constructed differently. The ones made last Saturday weighed in at 7.3 pounds and 7.7 pounds, respectively. 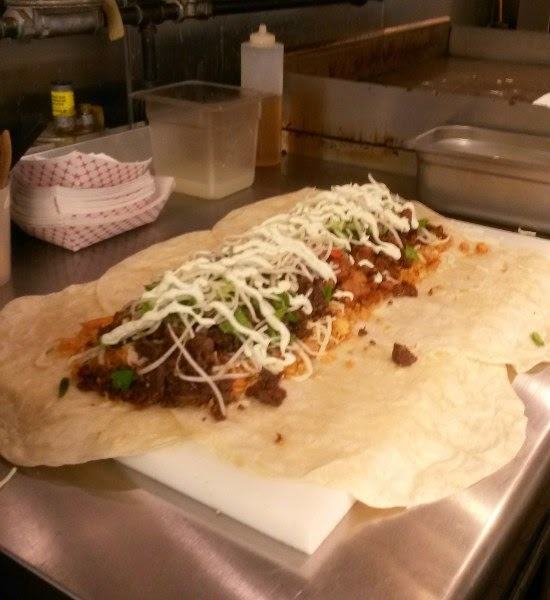 That's just the burrito, not including the tray. The burrito was the size of a newborn baby. Congratulations to all the competitors who each now have another food baby. Local station KATU sent a photojournalist to film the event for the evening news. Go here for KATU's video! 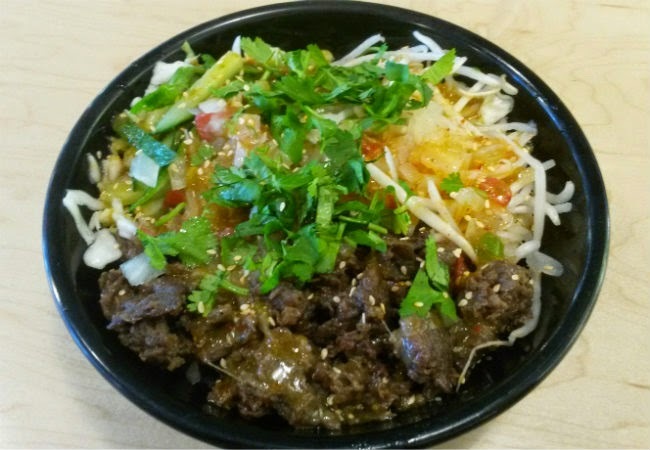 I enjoyed by Bulgogi Rice Bowl with some Adoboloco Ghost Pepper sauce and took a front-row seat for the spectacle to come. After starting their filming for their channel, Max Carnage and Pac-Man went to town on their massive burritos. In the end, the KBOMB prevailed this time. 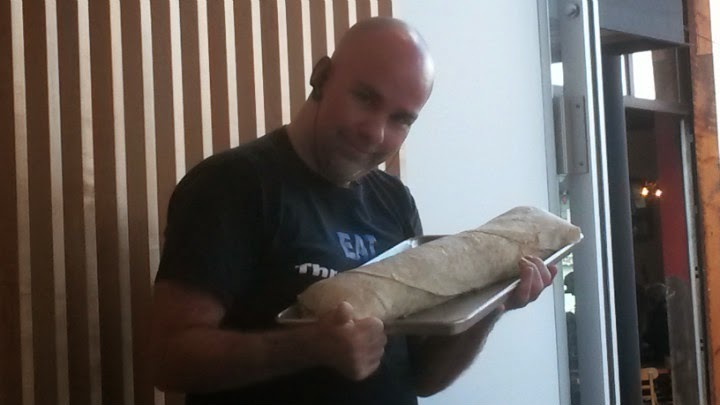 Apparently, it may not be in one's best interest to "talk smack" before the burrito challenge. As I've personally told Bo, I'd probably need a week to finish it. Mainly because I want to enjoy it with my ghost pepper sauce. And it's worth noting that I also have a Trinidad Scorpion Pepper sauce from Adoboloco that is not sold on the company's website. 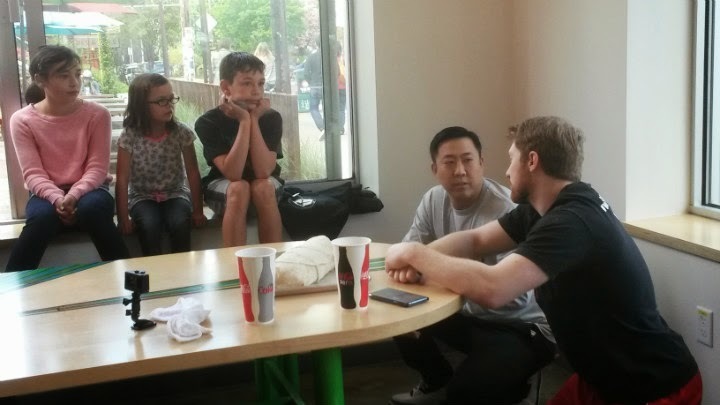 KOi Fusion might make the burrito challenge a regular thing, but it could be limited to occasional scheduled events at this time. They were accepting up to three walk-ins for this past Saturday's event, but there were no other participants. 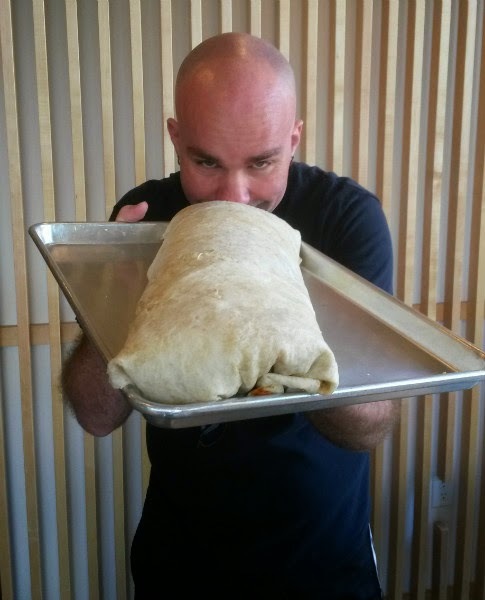 Do you think you can defeat the KBOMB burrito challenge at KOi Fusion?